Helseth Sadalvel is a Dunmer caravaner who can be found on top of the Caravaner Tower in Vivec City. 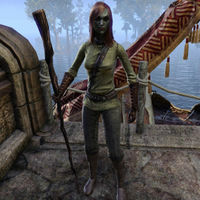 She offers more travel options than the average caravaner: Suran, Balmora, Gnisis, or Tel Mora. "Yes? Can I help you? Or are you going to stand around slack-jawed all day? Well, where would you like to go?" "Are you waiting for an invitation? This is a caravaner station, so I'm assuming you're in need of a ride. Come now, where do you need to get to?" "Get on or get moving. I don't have all day. Can your silt strider take me to a nearby settlement? "Looking to get out of Vivec City? Smart decision. I could use some time away myself. I can take you to Suran or Balmora. They're fairly close. Do either of those locations interest you?" I'd like to go to Suran. I'd like to go to Balmora. Actually, I'd like to go somewhere a bit more distant. Can your silt strider take me to a distant settlement? "Farther away? That's probably a good idea. I can take you as far as Gnisis or Tel Mora. Do either of those locations interest you?" I'd like to go to Gnisis. I'd like to go to Tel Mora. Nevermind. Can you take me somewhere else in Vvardenfell? This page was last modified on 9 May 2018, at 02:08.